Hemp is one of the most powerful plants in the world, producing twice as much fiber as cotton, using far less water and pesticides… and fixing the soil while it’s at it! Because of its misunderstood association with marijuana, it’s been illegal to grow in the United States for over 80 years. But luckily, for the people and the planet, Congress finally passed The Hemp Farming Act in the farm bill in December, giving American clothing manufacturers a local, more affordable source of hemp fiber. 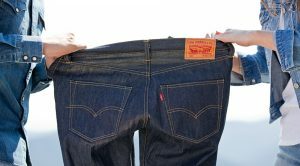 In an effort to brand itself as more sustainable, Levi Strauss will now be offering jeans made out of 30% hemp, 70% cotton. 100% hemp would be nice, but hey, it’s a start. The company had some concerns about how hemp would be received by consumers who have grown accustomed to the texture of cotton. Hemp can be a bit rough or stiff, like linen. So Levi’s has come up with a way to “cottonize” the feel of it. “We partnered with fiber technology specialists to create a ‘cottonization’ process that softens the fiber — using very little energy or chemical processing — to make it look, and more importantly feel, almost indistinguishable from cotton,” the company says in a press release. The cannabis analytics firm New Frontier predicts that the hemp industry will reach $5.7 billion by 2020. This is great news for the environment, as hemp plants yield twice as much fiber as cotton per acre, using about a tenth the water, and far fewer pesticides and herbicides. Hemp can actually heal our soil by removing toxins from it! Clothing and other textiles made from hemp are also far more durable than cotton, so they last longer and need to be replaced less often.